The aim of this paper is to explore how shifts in employment structure affect earnings dynamics and wage inequality throughout the wage distribution in four European countries (France, Germany, Italy, and the United Kingdom). 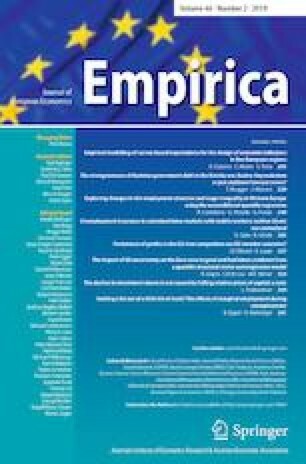 Through UQR on the EU-SILC data, the analysis achieves two purposes: (1) understanding the primary forces of the wage and wage inequality generating process; (2) evaluating the changes over time in the marginal quantile of wage distribution and the changes in inequality at different points of the distribution. The results highlight the role of the occupational patterns in wage dynamics. France and Germany show decreasing patterns of wage inequality, despite having opposite changes in wages. Their respective well-defined structures (upgrading of occupations and job polarisation) have an equalising effect on the wage distribution. The United Kingdom and Italy show increasing patterns of wage inequality although maintaining opposite changes in wages. While the relative upgrading in the United Kingdom has only slowed inequality growth, the more hybrid pattern of Italian employment structure has contributed to raise the overall inequality. See Tables 8, 9, 10, 11, 12, 13, 14 and 15.